The thinnest PC notebook gets thinner, sleeker and faster — but it's still not an ultrabook.The updated Samsung Series 9 manages to be even thinner and lighter than the original, at just 12. The thinnest PC notebook gets thinner, sleeker and faster — but it's still not an ultrabook. The updated Samsung Series 9 manages to be even thinner and lighter than the original, at just 12.9mm and 1.16kg for the 13.3in. model. The 15in. model is still only 14.9mm and 1.59kg, and the chassis looks more like a 14in. system. The chassis is so thin it barely has room for the curves that give the keyboard the slightest of angles. Meanwhile the screen is so thin it's protected by a narrow rubber strip that also stops the isolated keyboard from pressing too much on the display when it's closed. There's also barely room for ports, which are hidden in pull-down wedges on each side. You get USB 3.0 and a charging USB port, a microSD slot and a headphone/microphone combo jack. The HDMI and Ethernet ports both need adapters, which is annoying but unavoidable with a notebook this slim. If you find a projector with an adapter on your travels, you could use the Intel WiDi instead. The power connector is tiny too, and instead of the usual power brick you get a tablet-style all-in-one plug (with changeable pins for travellers). The brushed duralumin case of the original is replaced by a matte-blasted aluminium case in the same near-black that doesn't show fingerprints (neither does the coated glass touchpad, although the keyboard surround certainly does). The metal case is strong enough to keep the chassis rigid and the screen doesn't flex unless you twist it deliberately. Even better than the matte finish on the case is the matte screen, which is bright and colourful, automatically adjusts brightness to suit the ambient lighting, has a great viewing angle and no reflection problem at all. The extra-large glass touchpad also has a matte surface, which makes it comfortable and responsive to use; we didn't notice any of the jumpiness that made the original Series 9 frustrating to use. The backlit keyboard has generously sized keytops and good spacing, even on the 13.3in. model, although the left Shift key is too narrow and the Caps Lock too wide. It's also frustrating not to have full Home/End and PgUp/PgDn keys; having these as secondary functions on the arrow keys is more awkward and slower when you're working your way through long documents. You can do that for quite some time with the notebook's claimed 7-hour battery life, while the 128GB SSD, 4GB of RAM and 1.60GHz Core i5-2467M CPU make for a speedy system with fast startup. The software that tunes the systems is a little naggy about getting you to run it to optimise things, but booting in just under ten seconds and resuming in two seconds make this a very responsive system. 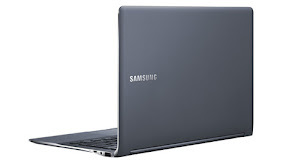 The original Samsung Series 9 pioneered the idea of ultrabooks, although like this even thinner new model it never had an ultrabook name — or price. The Series 9 remains a premium ultraportable with a premium price (£1,199 with Windows 7 Home Premium, currently exclusive to John Lewis). It's still pushing the envelope — or indeed, with those knife-thin edges, cutting its way out of the envelope — although we didn’t find it uncomfortable in use. And while the slim lines and curves are still reminiscent of the MacBook Air, Samsung gives the second-generation Series 9 its own style. If you want the thinnest, lightest PC possible without giving up a good mix of ports, the Series 9 is an impressive option that looks the part.